I grew up in the mountains of Salida, Colorado on my family’s farm with horses, chickens, cows, dogs, and cats. My best friend was a hybrid dog named Raydar. Raydar and I spent our childhood adventuring and exploring the Rockies together. Charissa & Raydar playing dress up. I think back on my childhood and realize that there were always dogs around; when I had Raydar, we also had four other dogs. I learned a lot about dog communication by watching our five (or more) dogs interact and figure out life together. We never owned leashes or groomed our dogs, the dogs slept inside and ate scraps mixed with what ever else was laying around. Our dogs were treated very well and all lived full long lives but they were always just dogs. They spent most of their day outside laying in the sun or protecting the cows, they also went on adventures when we would go hunting or out to chop wood. In town they followed us around the streets saying hello to other dogs or slept in the truck if we just had to run errands. I remember thinking it was weird that people didn’t take their dogs everywhere with them. I moved to Ohio during my teen years, and there began working professionally with animals in 2009 at a local humane society and soon discovered a passion for helping those in need. I remember this time in my life vividly as I started working at the shelter and soon discovered people treated their animals very differently then I had as a child. They would surrender their old dogs because they just purchased a new puppy. Or people would hurt and abuse their dogs because they were acting like any dog would. I also saw a lot of good people give loving homes to shelter dogs! While working at the shelter I was able to intern under a "balanced” trainer teaching classes and training the shelter dogs. In that time a skinny pit bull/hound mix named Dylon walked into my life. Dylon had been abandoned and tied to a tree so that his collar had become imbedded and he was diagnosed with acute renal failure due to stress. The shelter’s veterinary team was not optimistic. But Dylon chose me. There had been a handful of dogs I wanted to adopt from the shelter but alas this skinny boy wouldn’t leave me alone. He went home with me as a foster dog were he recovered quickly, and soon after I adopted him. However healthy, Dylon had many behavioral hiccups such as separation anxiety, handling sensitivity, and lack of manners. I was unable to use force or intimidation with Dylon due to his injuries, and this prompted me to began researching positive training methods to use with him. While I was training under my mentor he told me these methods would never work and that I would never be a good trainer because I was a girl and thus I was not strong enough (mentally or physically) to make a dog respect me. This lit a fire under me to prove him wrong. I knew that by using love and empathy I could build a relationship with an animal and in this way I could teach them new things! Dylon proved that trust was the key to building a lifelong relationship with me, that to this day is unbreakable. Charissa and Dylon near Red Feather Lakes paddle boarding and looking for Ducks. In 2013 I dedicated my career to progressive positive reinforcement marker-based training. I decided to take Karen Pryor’s Certified Training Partner course and graduated as a certified animal trainer in 2014. I am enthusiastic about continued education and public outreach. In 2015 I received a second animal training certification through CCPDT, becoming a Certified Professional Dog Trainer – Knowledge Assessed. I am currently working towards a Silver Certification in Low Stress Handling. My current job is at the Humane Society of Weld County as the Behavior Technician, in addition to being the Associate Trainer at Summit Dog Training. I am working to develop the behavior department at the shelter and group classes for the animals in the shelter's care as well as the animals in the community. I also work at CSU as a Colorado State University lab instructor for the first year Veterinary Students teaching low stress handling. I spend my free time camping and hiking with Dylon and a new addition Arja, a Cornish Rex kitten, in beautiful Fort Collins, CO. My goal is to change myths about shelter dogs and express to owners that compassion, trust, empathy, and fun build lasting human animal bonds. I want to show people that we can allow our dogs to be dogs and that by doing so we are fulfilling their needs and creating behaviorally healthy canines. And that when someone tells you that you can’t, prove them wrong. Dylan gets cozy on a mountain adventure as the night slows down. Each adventure you embark on with your dog has the potential to be fantastic. Idyllic. Instagram-worthy. Like strolling through the Shire on a warm, sunny day. Well, as close to the Shire as you can get in real life, anyways. Lory State Park, Colorado. 1. Adventures with dogs are often messy. And wet. And muddy. Roo's favorite part of any adventure is the "getting as filthy as possible" part. Going in with this understanding and expectation will greatly reduce your dirt-induced stress and increase your dog's enjoyment of the experience. To mitigate this aspect of dogs on adventures, I recommend proper, mud-durable apparel for you, and appropriate drying equipment (like towels) or containment tools (like crates) for back at the car. Unless, of course, you have a super-cool and awesome dog-mobile and don't care if your dog finger-paints with mud on the back seat, in which case I think we'd be good friends ;). 2. Dogs often have a different idea of "fun" than we do. To many dogs, finding every unique smell on the trail or running helter-skelter through the brush is intoxicating; to us, stopping to allow our dog to sniff at every little stick or leaf or running hither and thither after who knows what isn't exactly what we had in mind when we left the safety of the backyard. The important thing with these competing motivations is to find a middle ground where both ends of the leash can be satisfied. Ideally, this is an understanding between you and your dog that permits them to run around unleashed to their heart's content (leash-laws permitting), but when you say "Rover, come!" they are back at your side in a split second. Leading up to this point is a lot of dedicated recall work - stay tuned for a future blog post on that! If your dog isn't able to run unleashed, teaching a consistent "check-in" behavior on-leash is a good next step. 3. Work up to it. The first time you take your dog out on an adventure, whether as a puppy or as an adult dog, don't be surprised if all of the cues your dog knows so well at home suddenly seem to be forgotten. Dogs are not great generalizers anyways, but the added distractions and allurements of the new environment complicate things even further. As you increase the level of distraction in the environment around you and your dog, you should be ready to reduce your criteria somewhat (i.e. 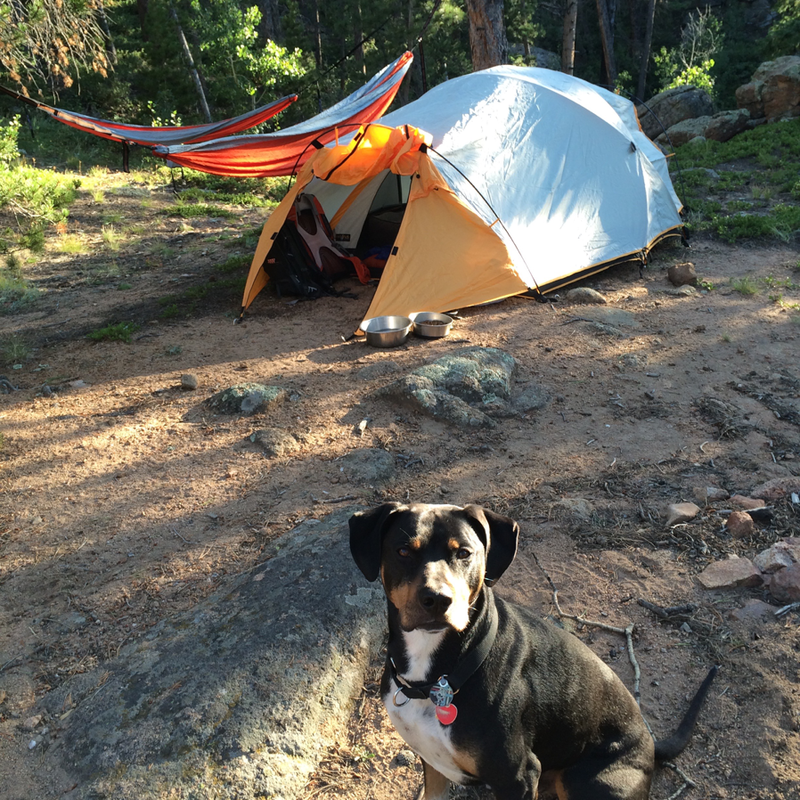 don't expect a perfect 3 minute down-stay beside a busy trailhead when you have only been practicing in your backyard) to set your dog up for success. Increasing your quality of reinforcement is also a good idea as you start working in new places. Just because your dog works for kibble at home doesn't mean that will be reinforcing to him when there are squirrels all around! Eventually, the goal in training is to be able to reduce the frequency and the value of the reinforcers, but at first, we make sure that the reward is appropriate to the behavior we ask for. 4. Remember, adventures are about having fun for you and your dog. If either of you are struggling, take a break, take a breath, and try to find the good things your dog is doing (even if they seem very, very small) and start from there. Stay tuned for future posts about specific skills that are useful for every canine adventurer to know to promote a safe, fun experience for everyone on the trail! 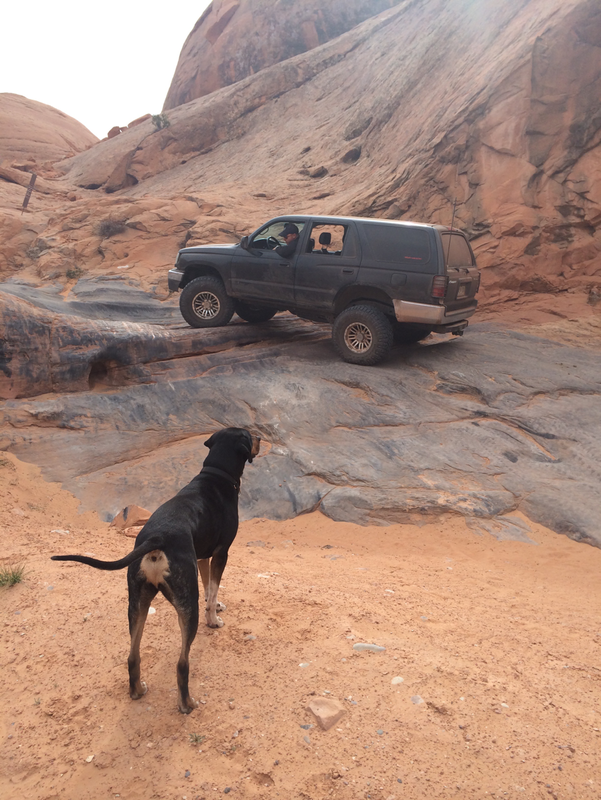 At Summit Dog Training, we believe in adventures. We believe in fresh air, sunshine, mountains, and deep breaths. We also believe that no adventure is quite complete without a four-legged companion by our side. Dogs tend to enjoy every moment of every adventure in a way that is infectious. If we follow their lead, this natural enthusiasm can enhance our sometimes less-perfect human enjoyment and encourage us to be more present, more free, and more mindful at every step of each experience. I caught this infectious excitement about experiencing life from my Australian Shepherd, Roo, almost 8 years ago now. His enthusiasm and energy for all things outside and active has kept me on my toes since I first brought him home. Even today as an official canine senior citizen, when we are backpacking together he does about three times as many miles as I do, running back and forth between the exotic new smells and scenery and his human family. This enthusiasm never fails to make me smile like the crazy dog person I am, and every time it reminds me why dogs are a wonderful addition to all types of adventures. But in order for humans and dogs to fully enjoy outings together, there are some skills necessary on both ends of the leash. This is the mission and passion of Summit Dog Training: helping dogs and their owners prepare for doing awesome things together, whether that is a peaceful walk in the park or hiking off leash in the beautiful back country of the Rocky Mountains. These adventures are founded on friendship, trust, and effective communication between dog and human, and this is something that is attainable for all dogs and their people! We believe that dogs enrich our lives and our adventures, and, in turn, that inclusion in our adventures also enriches the lives of our dogs. Are you and your dog ready for a new adventure?